When we reach a certain age, we always want to keep our skin younger-looking, because the concept of aging is so scary! Ya, I totally agree with that! It's very important for women to keep the skin looking young, plump and have fade wrinkles. As far as I know, the perfect age to start the anti-aging skincare is about 24 years old. Well in fact, the earlier you begin an anti-aging regimen, the more you can prevent premature aging. There are endless anti-aging products in the market, but to be honest I found many of them are very expensive in the market. Try to walk to a skincare brand counter at a local shopping mall and ask for their anti-aging series, I'm pretty sure the series will be much higher than the other series. 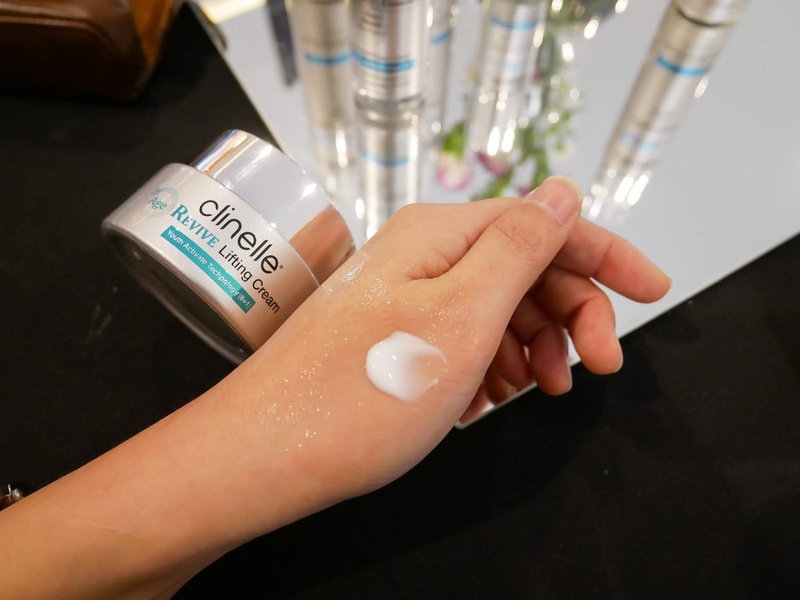 So, when I first known about the new anti-aging series from Clinelle, I was so excited till cant't wait to share it with you all because the brand do offer high quality products yet affordable pricing! 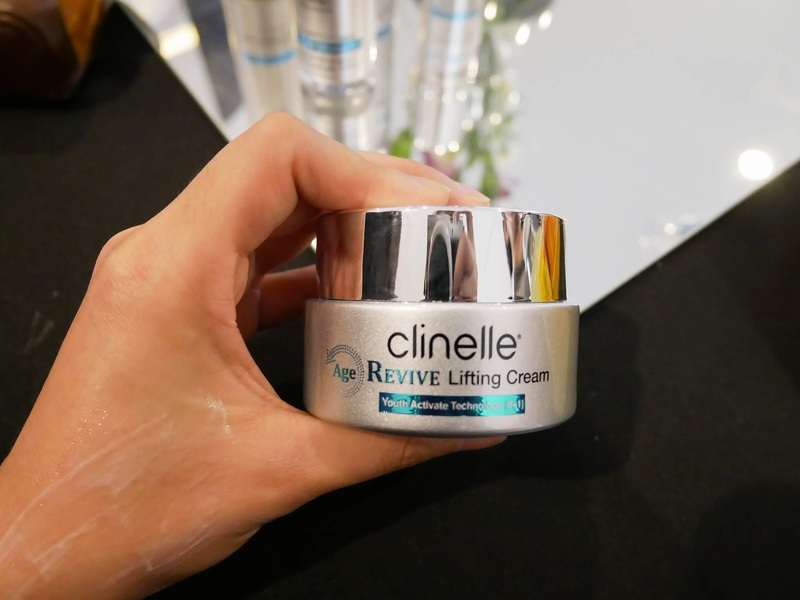 Clinelle Age Revive is a perfect blend of nature and science to treat every sign of maturing skin to create a lifted, firmer, and more contoured look. The entire range is packed with proven anti-agers that addresses everything from fine lines, wrinkles, dryness, uneven skin tone, rough skin to sagging and volume loss. #1 Spilanthes Acmella Flower Extract: helps skin reorganize and support skin structure for a firmer skin, instantly reduces fine lines and wrinkles to restore a more youthful, firmer and V shaped appearance. #2 Youth Activate Technology (8+1): the precious Crocus Chrysanthus Bulb Extract mimics the power of synthetic fillers to visibly delay the appearance of skin aging signs, rapidly rejuvenate skin texture, enhance firmness and promote skin radiance. Also, the look of dark spots and pigmentation gradually diminishes, creating a more even skin tone. #3 Anti-pollution and Anti-UV Rays: infused with potent antioxidant to protect skin damaged by pollution, environmental aging. UV rays (photoaging) from daily exposure, and also nitrogen and oxygen free radicals. Both the Anti-pollution and Anti-UV Rays are tested and proven to have greater antioxidant effects than Resveratrol, Vitamin E and ferulic Acid. #4 Efficacious yet safe with 7Nos: it's formulated with 7 Secrets to Happy Skin (No artificial colouring, No artificial fragance, No lanolin, No mineral oil, No SD-alcohol, No comedogenic ingredients and No paraben), which is safe and suitable for all skin types including sensitive skin. 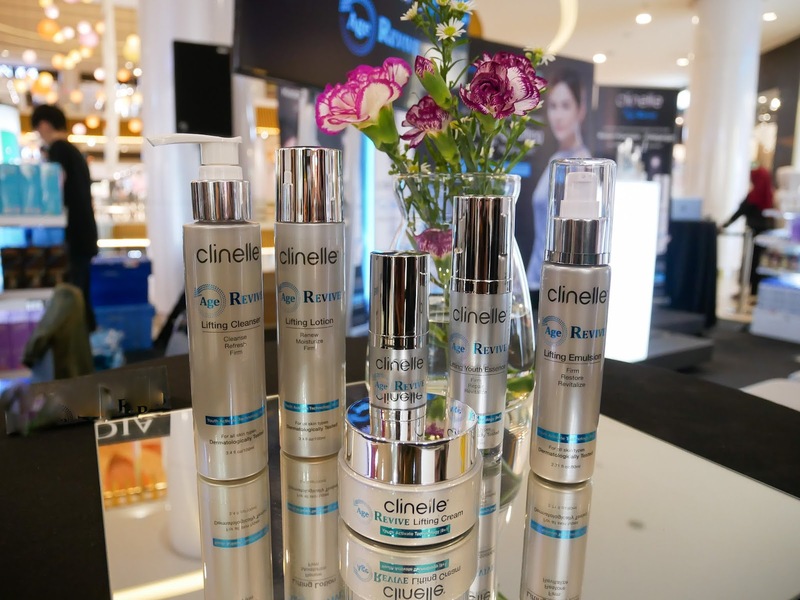 All Clinelle products work effectively to free skin from rapid environmental aggression with RX3 Action, by repairing, refining and re-shielding skin for optimized skin health and clearly visible and long term results. 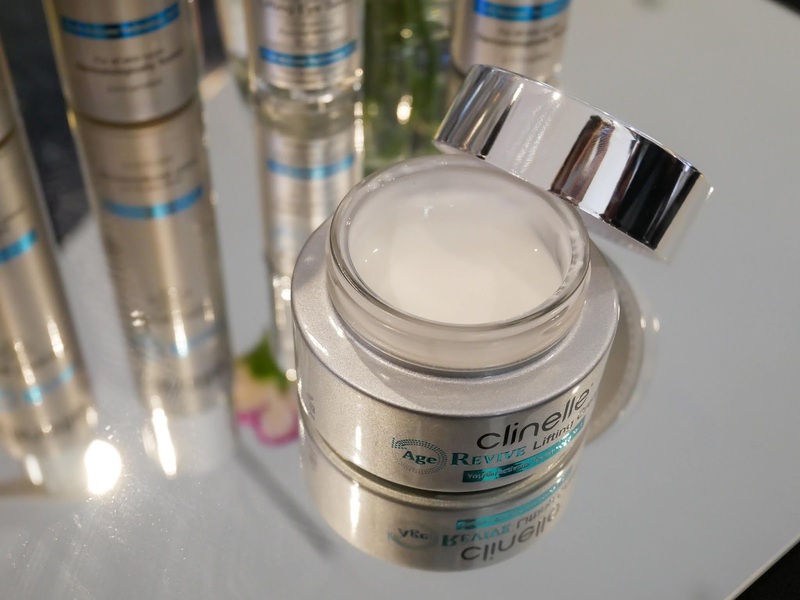 Clinelle Age Revive consists of total 6 SKUs products manufactured from France. The full range consist of Age Revive Lifting Cleanser, Age Revive Lifting Lotion, Age Revive Eye Serum, Age Revive Lifting Youth Essence, Age Revive Lifting Emulsion and Age Revive Lifting Cream. For today's post, I would like to highlight the 2 popular products from the series. Age Revive Lifting Youth Essence @ RM113.11 (20ml), comes with a classic silver pump dispenser bottle. 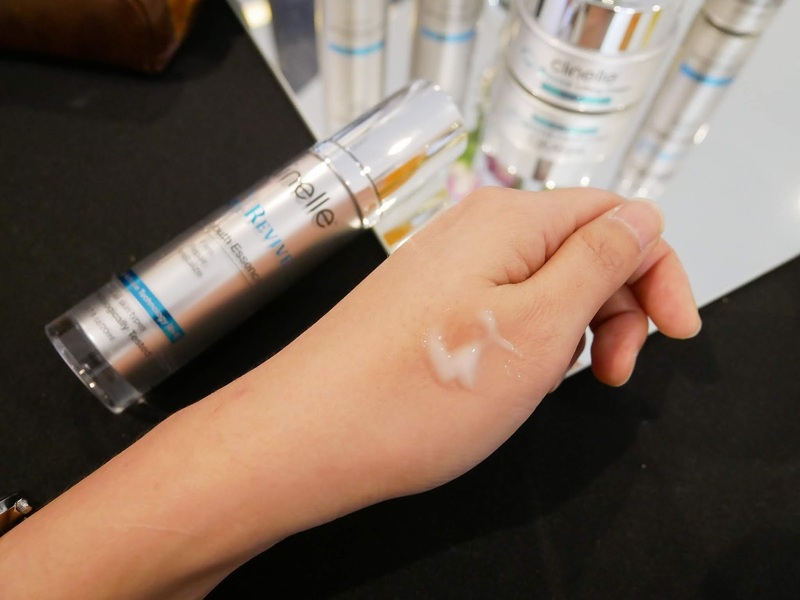 I tried it on my hand and I can feel the texture is very light, so the overall absorption are fast without giving any sticky feeling on your skin at all. You just need to pump a small amount onto the palm, then apply gently in upward motions over your face and neck so that it helps to reduce skin sagging etc. Age Revive Lifting Cream @ RM113.11 (40g) also packed in a silver colour round bottle. It's not a heavy night cream like the other face creams. The texture is pretty light, so the absorption is quick without any sticky feeling. Take sufficient amount onto palm, gently apply over face and neck using upwards movements. 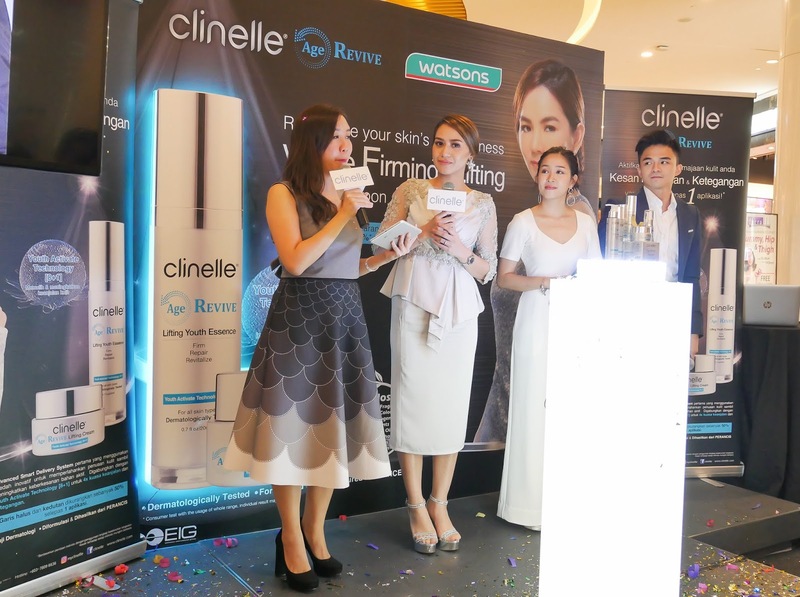 Ambassador of Clinelle since 2015, Shima Anuar: "Balancing motherhood and a career are tough for me. I came to notice my skin condition has changed and required more care than before. My lifestyle has taken a toll on my skin because of the hectic working scheudle and sleep deprivation from juggling between family and work. 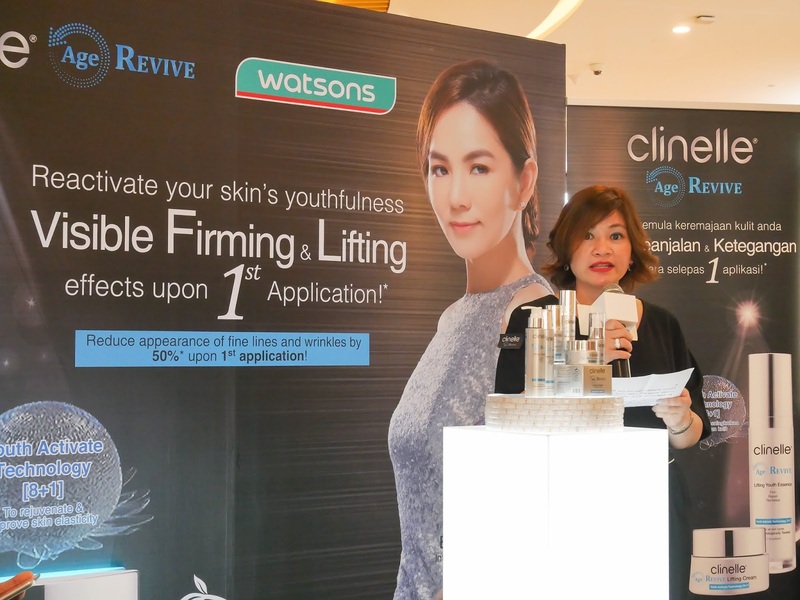 As a result, my skin has aged much but fortunately, Clinelle has introduced the new anti-aging line Age Revive that offers the solution to all my skin concerns." 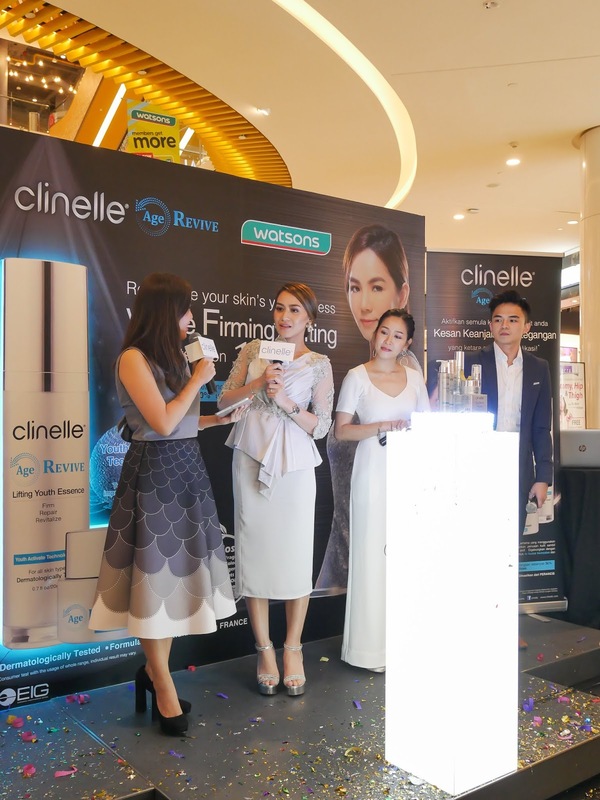 Shima Anuar uses Clinelle Age Revive range on daily basis now and the results are impressive as her skin has improved so much in merely 7 days; looking more hydrated, radiant and fine lines are less visible too. 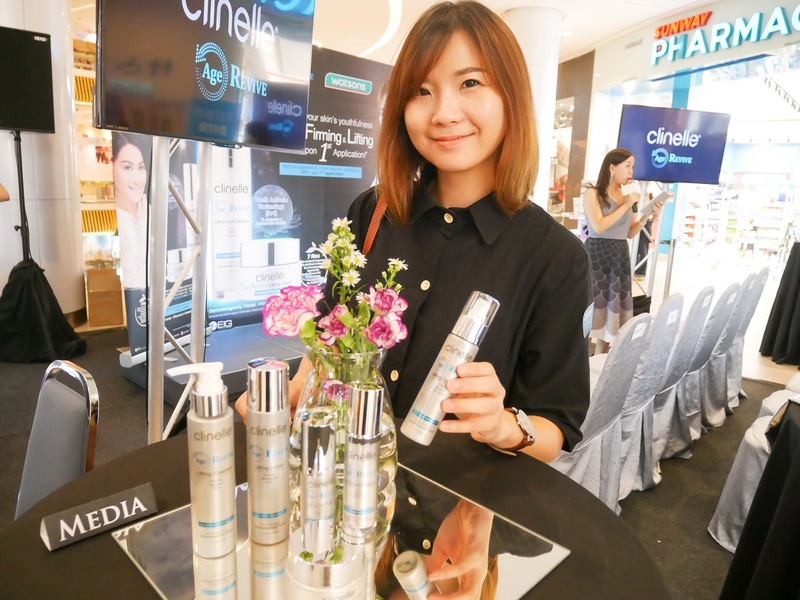 Her favourite is the Clinelle Age Youth Essence because the texture is light, non-sticky and it is easily absorbed into her skin. 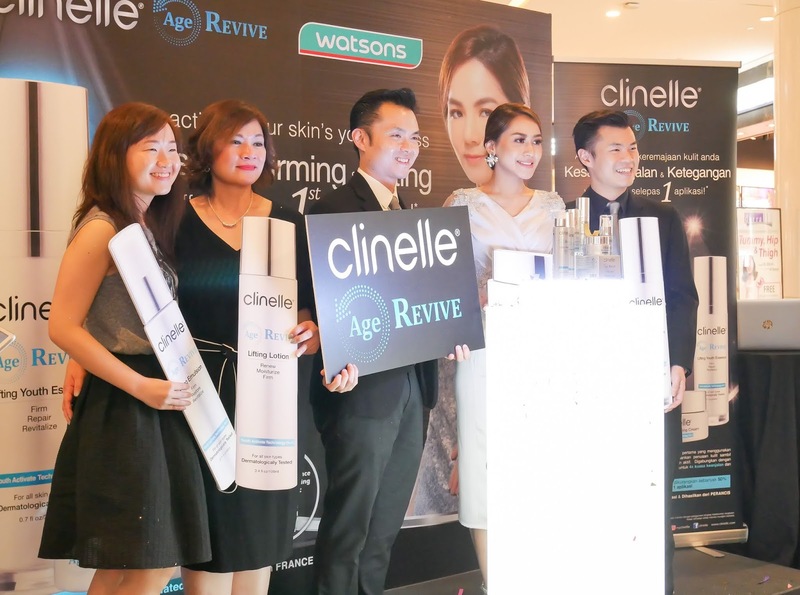 Aesthetic Skin Expert, Dr Wong Yuet Sin: "Skin ages due to biological aging which is a natural process, however, there are other factors that accelerates aging process. Our skin is at the mercy of environmental aggression, UV rays (photoaging), lifestyle due to unhealthy diet, smoking, drinking, stress, sleep deprivation down to skin that is poorly taken care of. 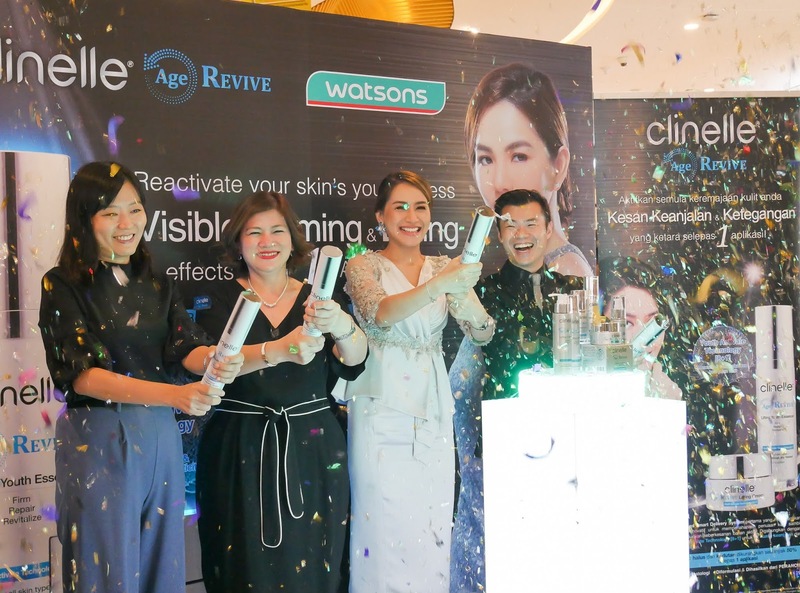 It is important to invest in good skincare product with formulation and ingredients that effectively repair damaged skin, strengthen skin health and lastly, provide protection against environmental aggression and daily pollution." 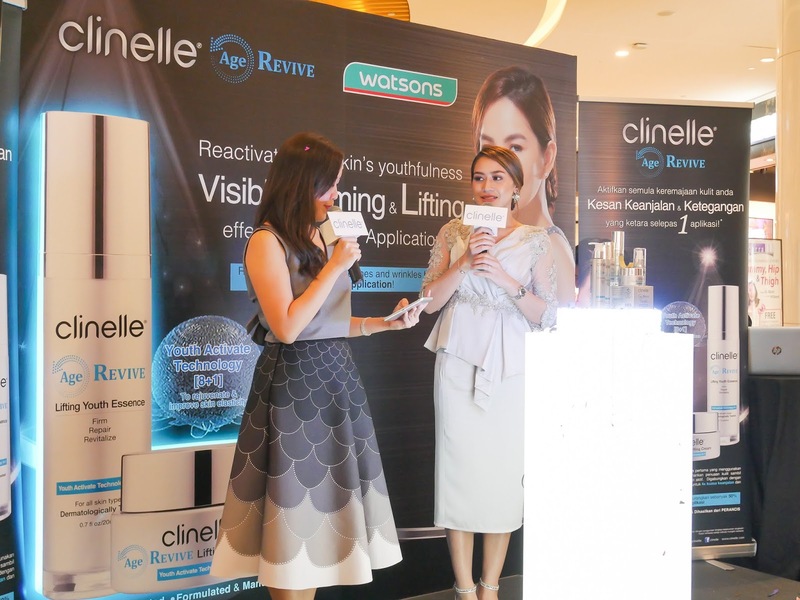 Senior General Manager of EIG Pharma Asia (M) Sdn Bhd, Ms Connie Lee: "The latest Clinelle Age Revive is powered with advanced smart delivery system to enhance the efficacy of active ingrdients and provide greater and more efficient skin penetration into the skin. We have developed a line of advanced anti-aging skincare to reactivate your skin's youthfulness and slow down skin aging. 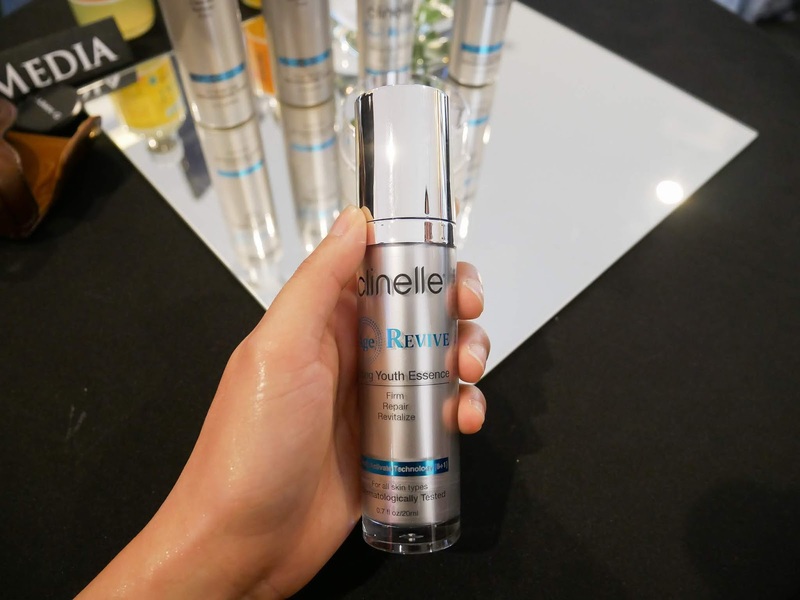 Clinelle Age Revive is the most advanced anti-aging developed by Clinelle by far where, visible firming and lifting effects are noticeable upon 1st application. All ingredients formulated are integrated with RX3 Action to repair, refine and reshield to help skin perform at its maximum potential." 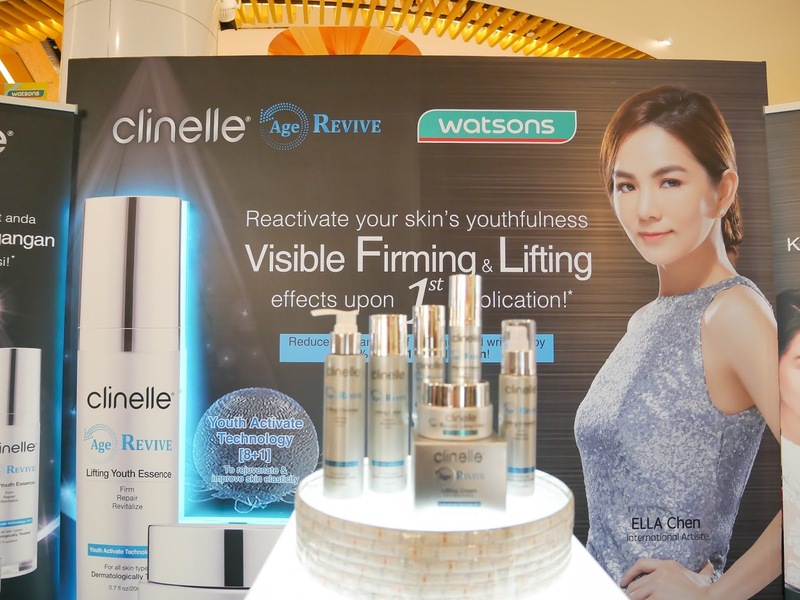 Clinelle Age Revive series is now avaiable at the major pharmacies, include AEON Wellness & Supermarket, Caring, Guardian Watsons and also selected independent pharmacies nationwide. Do keep the updated news and events about Clinelle at their official website at www.clinelle.com.